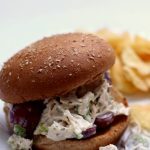 Instant Pot/Slow Cooker Chicken Salad–chicken is pressure cooked or slow cooked and then tossed with the best chicken salad dressing to make a fantastic topping for a bed of lettuce, a bun or croissant. In the past I don’t think I have really appreciated chicken salad. I guess mostly because what I have tried has been drowned in mayonnaise and it didn’t have a lot of seasonings or flavor. My mind has officially been changed today! 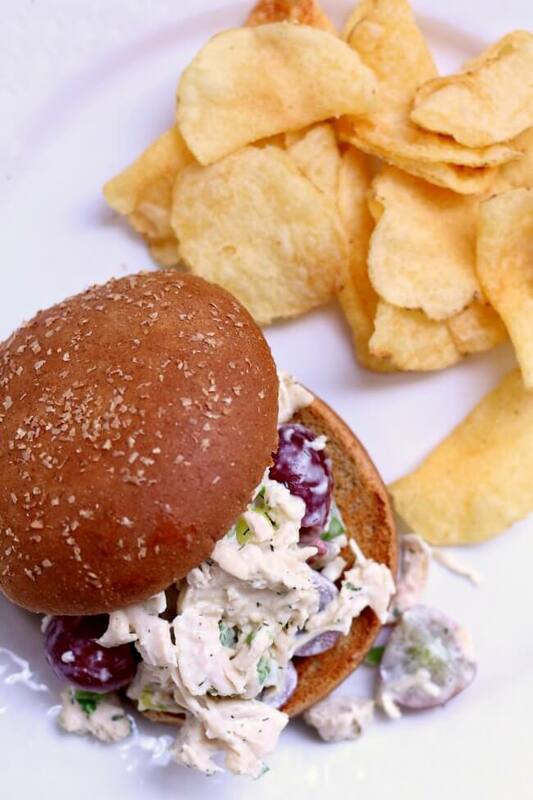 This is the best chicken salad! It has a lot of flavor and I have been sneaking bites of it all day. My kids both give it a thumbs up! I served mine on whole wheat hamburger buns but if you want to get fancy you can serve it on croissants. If you’re trying to watch your carb intake you can serve it over a bed of lettuce. I like the idea of this chicken salad because it’s something that can be prepared ahead of time and refrigerated until you’re ready to serve it. You can serve it with chips and raw veggies. I do believe that the grapes are not optional, even though I wrote optional in the recipe. The reason? The savory and sweet play well off of each other. Without the grapes it just seemed like something was missing. 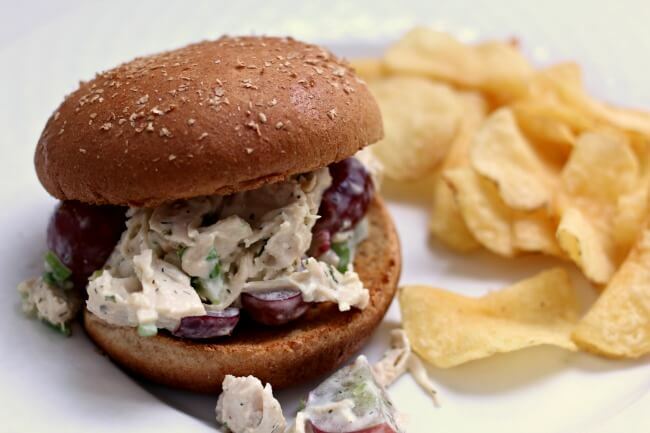 Try out this easy instant pot/slow cooker chicken salad sandwich recipe this week! You won’t be disappointed. What Pressure Cooker/Slow Cooker Did You Use? To make Instant Pot/Slow Cooker Chicken Salad I used my 6 quart Instant Pot Duo 60 7 in 1*. I love this Instant Pot because it has the yogurt making function which I use almost weekly. It has two pressure settings (high and low), and there are also little slots in the handles so that you can rest the lid there instead of putting it down on your counter-top. For the slow cooker version, I used my 6 quart oval Kitchenaid slow cooker. * I love this slow cooker. It cooks low and evenly. I love the medium heat choice because most slow cookers that I’ve seen only have the option of cooking on low or high. If you’re going to buy just one slow cooker, this is the one that I recommend. 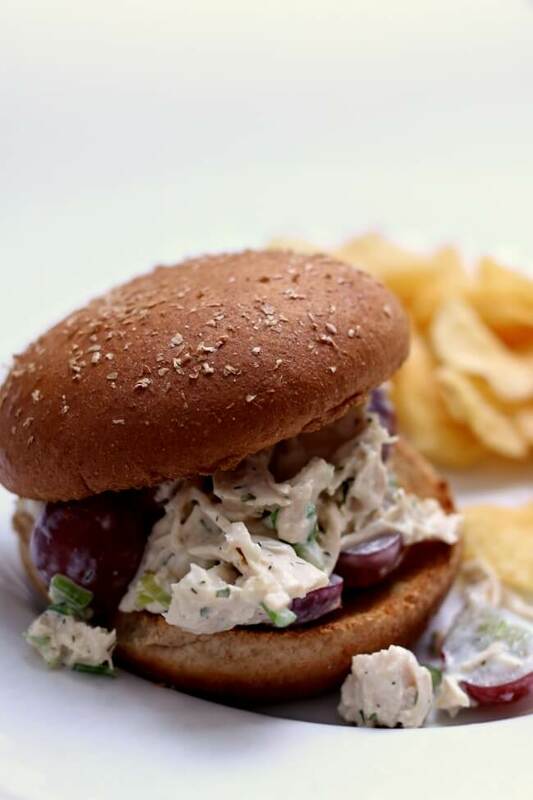 Chicken is pressure cooked quickly or slow cooked and then tossed with the best chicken salad dressing to make a fantastic topping for a bed of lettuce, a bun or croissant. For the Instant Pot. Place chicken in Instant Pot and pour in the water. Cover Instant Pot and secure the lid. Make sure valve is set to sealing. Set the manual/pressure cook button to 10 minutes (or 12 minutes for frozen chicken). Let the pressure release naturally for at least 10 minutes and then move the valve to venting. Remove the lid. Place the chicken on a cutting board and roughly chop it. (I used this chopper* and it worked great.) Put the chicken in an airtight container and set in the fridge to cool. Discard the water in the pot. For the Slow Cooker. Place chicken in the slow cooker and pour in the water. Cover and cook on low for 4-6 hours. Remove the lid. Place the chicken on a cutting board and roughly chop it. (I used this chopper* and it worked great.) Put the chicken in an airtight container and set in the fridge to cool. Discard the water in the slow cooker. Prepare the dressing. In a small bowl stir together the mayo, sour cream, lemon juice, dill, parsley, mustard, salt and pepper. Set aside. Chop. Chop and prepare the green onions, celery, grapes and almonds. Stir it all together. Once chicken is cooled stir everything all together until chicken is well coated. Salt and pepper to taste. Serve. Serve the chicken on a bed of lettuce, on buns or on croissants. This recipe can be gluten free. Frozen buns can be found in the freezer section at most grocery stores. Also, Chick-fil-A has delicious, moist, gluten-free buns that they will sell for around $1 if you want to go that route. Like this recipe for Instant Pot/Slow Cooker Chicken Salad? Get all my new recipes delivered to your email inbox by signing up below. Do you put the chicken on the metal insert that comes with the Instant Pot? Or does the chicken actually sit in the water in the pot? Thanks! I have done it both ways and it works either way. Do you think you could substitute plain, non-fat greek yogurt for the sour cream? Thanks for publishing these recipes and sharing your notes. Yes you could do that! The chicken salad is really good if you add a little curry powder to it. Love “365 Days”! Thanks for all the great information, recipes, and photos you share with us! Can I use a whole, cut up chicken instead of the skinless, boneless chicken breasts? If so, what changes in cooking time needs to be made for the instant pot? yes that would taste amazing. I’d cook the chicken pieces for 20 minutes instead of 10. Couldn’t the liquid from the alow cooked chicken be frozen and used for a veggie soup? Or throw the pre cut veggies right in? Seems like such a waste. yep you could do that. Hi! Really enjoy 365!!!! My favorite recipe is Creamy Basil Chicken and Tortellini! QQ: What’s the best way to double this chix salad recipe up? Obviously chicken and ingredients etc. Water doubled ? Time? Could I use all sour cream? I dislike mayonnaise. Yep totally. It’ll taste a little different but I bet it would still be good. I love your recipes but you don’t offer for email sharing therefore I have no way to get them to my computer. It would be so nice if you included email as well. I’ll have to look into that. Thanks for the idea.